*Katharina Frei* - Kreatives Sammelsurium: Thinking of You! Valentine's day is drawing closer that's why there is another Valentine's day challenge open. 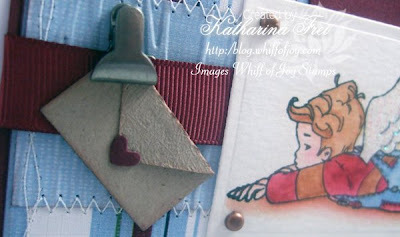 This time on the Cute Card Thursday challenge blog. So why not combine the Whiff of Joy and Cute Card challenges and get 1 card done for both of them? Das Thema Valentinestag verfolgt mich im Augenblick...haha Genauso ist nämlich auch die challenge auf dem Cute Card Thursday challenge blog. Also warum kombiniert ihr nicht einfach die Whiff of Joy and Cute Card challenges und macht 1 Karte für beide? 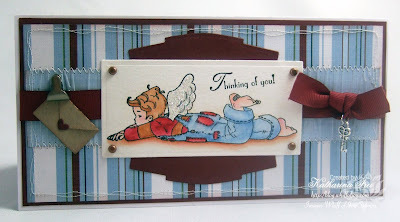 Guardian Angel boy Matthew designed by Elisabeth Bell for Whiff of Joy Stamps is the perfect stamp for romantic "Thinking of You" cards. I chose boyish colours and a clear boyish layout ;)The envelope die is from Quick Utz and I had it in my drawer for ages. I got the little school clip from my friend Inge. It's from Karen Foster Designs. I embossed the light blue paper with the Cuttlebug folder "forest branches" and sewed it to the background paper. Schutzengel Junge Matthew designed von Elisabeth Bell für Whiff of Joy Stamps ist der perfekte Stempel für romantische "Ich denk an dich" Karten. Ich habe mir jungenhafte Farben und ein klares Layout ausgesucht. Der kleine Briefumschlag ist von QuickUtz und ich habe ihn schon eine Ewigkeit in meiner Schlublade liegen gehabt ;) Den Schulclip habe ich von meiner Freundin Inge bekommen, er ist von Karen Foster Designs. Den hellblauen Streifen Papier habe ich mit dem Cuttlebug folder "forest branches" geprägt. I coloured Matthew with water soluble pens from Caran D'Ache and Twinkling H2Os. I added glitter to his wings and coloured the ground with Twinklings (cinnamon brown). Ich habe Matthew mit Aquarellstiften von Caran D'Ache und Twinkling H2Os coloriert. Seine Flügel sind mit Glitzer versehen und der Boden wieder mit Twinklings (Cinnamon Brown) coloriert. Paper: gcd Designs, SU cardstock "Bravo Burgundy"
Ooh, this is so gorgeous! Kirsten x.
beautiful card Katharina, I love the long style of card and the colours are pretty, the tiny envelope is so cute! What a sweet card. 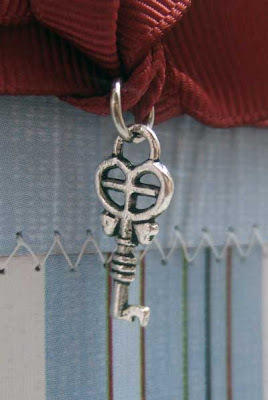 Luv the heart key charm. Love this stamp! Your card is fabulous!! Thanks for sharing. o Katharina,what a gorgeous card. Just love this card and the colours are beautiful. Gorgeous card Katharina and beautifully coloured! Beautiful card Katharina! It's fabulous!!! A gorgeous card, great layout!